The NEW Ripack 3000 Shrinkwrap Heat tool allows users to heat large areas of shrink wrap safely and quickly. The stainless steel nozzle can be turned a full 360 degrees and with its NEW cold nozzle system the gun remains cool during use helping prevent burns. To help you keep going, it comes with a back-up igniter. It weighs only 2.7 pounds, yet puts out 260,000 BTUs of heat making the Ripack 3000 light, fast and truly productive. 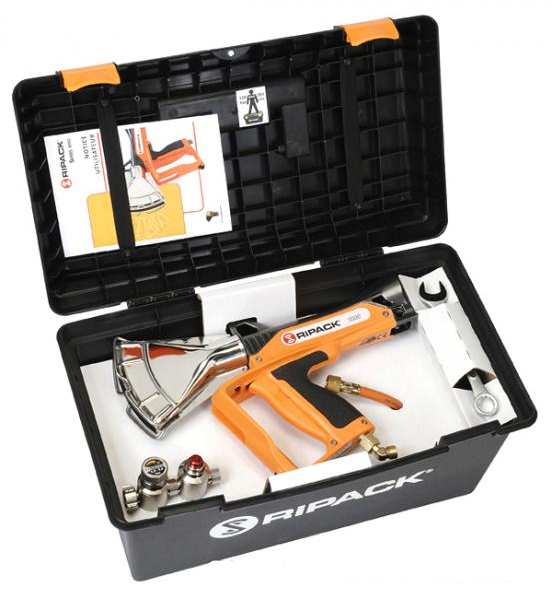 The kit includes: heat tool with back-up igniter, 26â€™ propane hose, Securipack – combined fail-safe regulator, high impact plastic case, and wrench for tightening fittings.